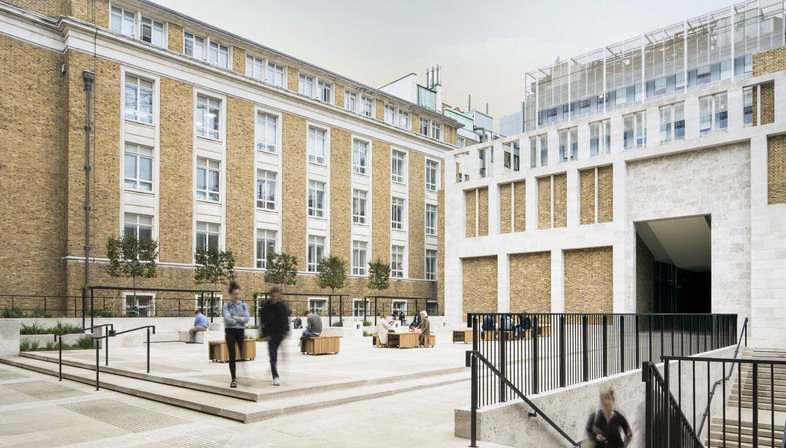 The challenge of connecting physically adjacent urban spaces which are rendered distant by the absence of synergies inspires the design of a new outdoor terrace for University College London designed by Levitt Bernstein. 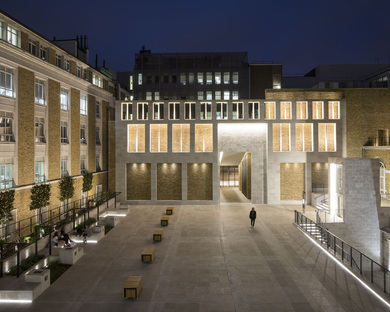 University College London, near Euston Station in northwest London, is a Georgian building occupying an entire city block, divided in half by the main building built on a north-south axis overlooking a big courtyard to the west and two smaller courtyards to the east, separated by the Bloomsbury theatre and studio complex, accessed from Gordon Street. 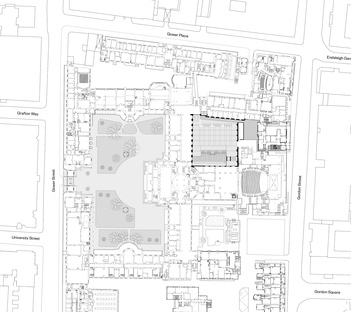 One of these two smaller courtyards, the one to the north, had been used for some time as a service yard for the buildings around it, an ugly storage area for skips and containers. 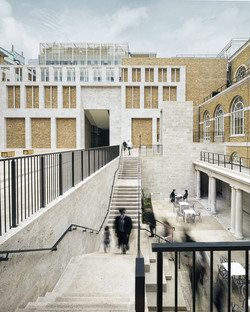 The university complex is constantly changing, for it is located in a historic building in London’s typical Georgian style and is constantly in search of new spaces to respond to the evolution of student life, so the question was how to improve the courtyard’s unfortunate condition and turn it into an opportunity to use the space more effectively. 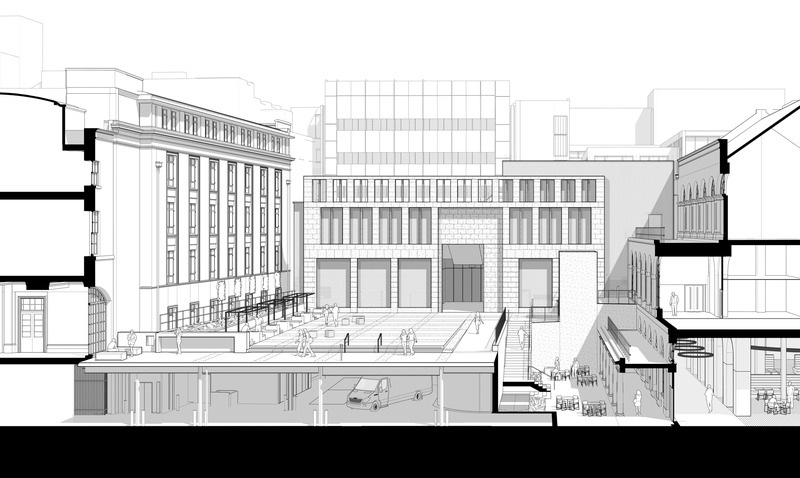 The architects of Levitt Bernstein raised the northern courtyard one floor higher, creating a new terrace which conceals the underground service area while leaving it available and fully functional for use serving the buildings around it. 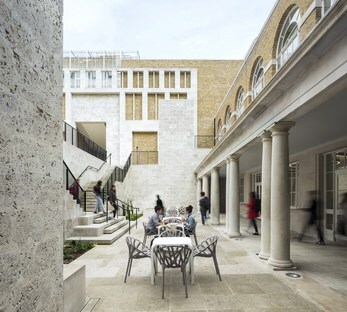 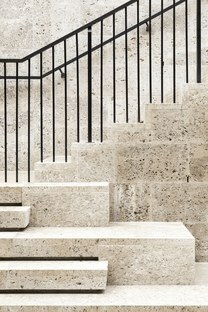 The new plaza, named Wilkins Terrace, is a courtyard paved with Portland stone, typically used on British neoclassical buildings such as the famous home of architect John Soane, now a museum. 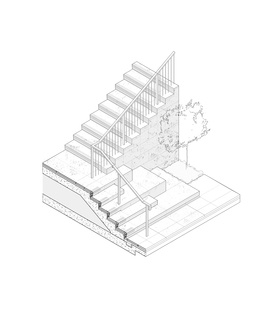 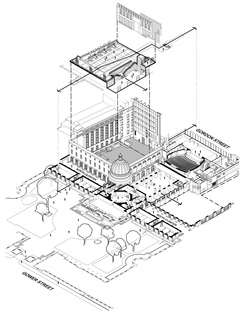 The plaza is designed like another façade, horizontally completing the three-dimensional urban space created by the walls of University College London overlooking the terrace. 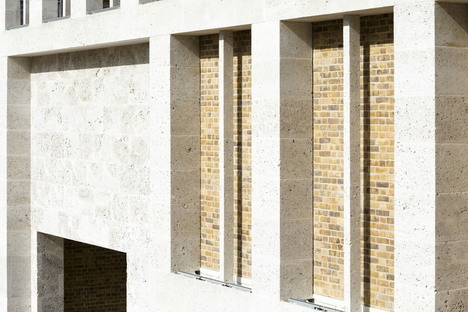 Their geometry and classic proportions inspire the design of the pavement and the new north-west wall, of which it appears to be an extension. 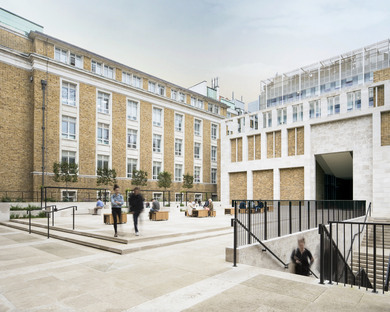 Its redevelopment, with Portland stone and London brick infill, also serves to connect the eastern courtyard with the Gordon Street entrance via a large gateway, improving pedestrian traffic flows in the university. 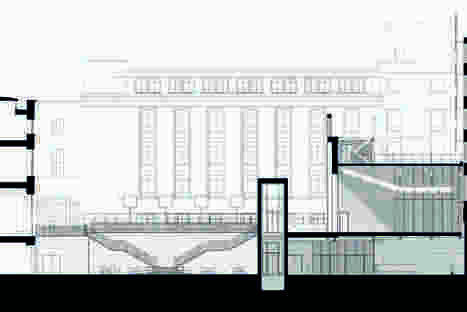 The terrace is designed on two levels, with a larger top level and a smaller area at street level serving the new dining hall, with its neoclassical colonnade, accessed via a lift and a big double staircase. 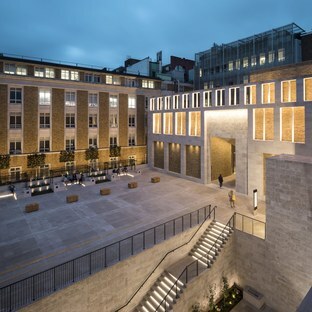 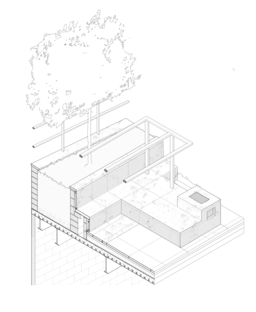 The courtyard on street level is thus concealed and maintains its service function for the buildings around it, but none of this is visible above: the terrace is an orderly open space that interacts intelligently with the façades of the buildings around it, also restored in the project. 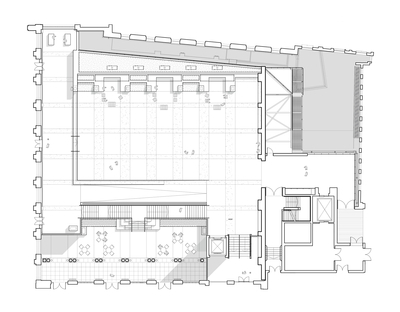 In structural terms, the construction consists of a concrete and steel frame permitting the passage of service vehicles below and organising all the storage areas. 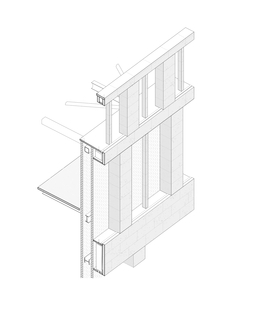 This structure supports the Portland stone used to pave the terrace and build the new eastern wall. 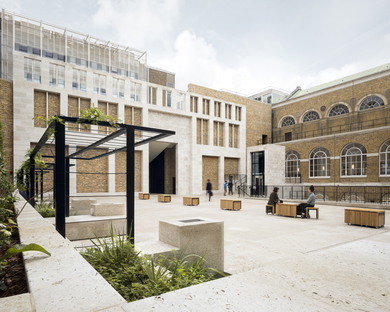 A place of transit, a community meeting-place, a place to stop and rest, to chat, read or take a break from studying, the new terrace’s landscape design suggests an idea of education still inspired by classicism, in which nature is present and reminds us of its importance. 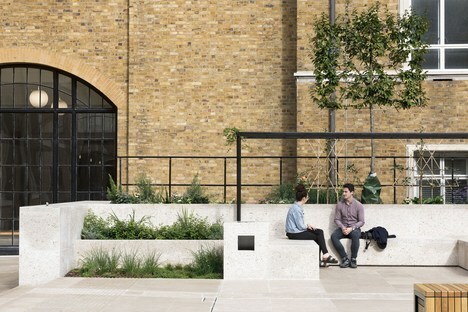 On the northern side of the terrace are seats sculpted in stone, alternating with fragments of greenery featuring flowers, herbs and fruit trees as well as a pergola covered with wisteria and grapevines, climbing plants that will grow with time to create an image of a “restful place”. Levitt Bernstein intends the redeveloped courtyard to become a meeting-place for the entire university, not just for one specific department, offering students, staff and visitors a place to meet and talk and a sheltered outdoor space in which to hold public events.